Since 2008, every Watt-Ahh bottle sold contributes two cents to non-profit organizations that help children. Our banner organization is Childhelp that gives both counsel and shelter to at-risk children . The total donation from our customers to specifically Childhelp is close to $15,000.00. Through the years, Childhelp Founders Sara O’Meara and Yvonne Federson have found the time in sending to us handwritten notes with profound encouragement and support, even when we raced the Watt-Ahh boat. We have shared part of their amazing story. The headquarters for Childhelp is located in Arizona. Their major fund raiser is an annual spectacular gala. On Saturday, February 2, 2019, many supporters as well as celebrities will be attending the Diamond Jubilee celebration. Congratulations to Sara and Yvonne and Childhelp in making miracles come true for children who have experienced tragic starts in their young lives. For the Sake of the Child, we hope your Diamond Jubilee Gala is a huge success. 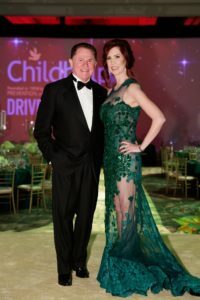 Photo above is Richard and Dr. Stacie Stephenson, 2019 Childhelp Gala Co-Chairs (photo credit to Childhelp’s website).